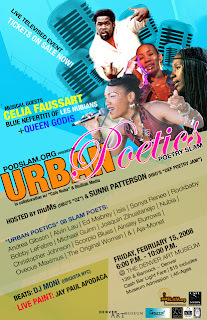 Get ready for the real unexpected at the Denver Art Museum on Friday, February 15th with podslam.org and Cafe Nuba for the premiere spoken word event "URBAN POETICS". This high energy and incredibly well produced poetry slam will showcase 16 of the top U.S. poets as well as live music by Les Nubians with Queen Godis and DJ Moni. They actually have $2000 in cash prizes for the winners who will be judged by the event's audience and you'll see high def film slam pieces on the ceilings of the Hamilton building. This is also a great way to celebrate African American history month as many of the featured poets are African American.